Sous vide works particularly well for the technique of confit as temperatures can be kept consistently low for a long time and considerably less energy is used than in an oven or on the stove. Confit egg yolks make a rich, buttery addition to dishes and can also be used to make creamy sauces. You can use various oils to flavour the eggs – try olive oil or rapeseed oil. Oil infused with herbs and garlic will give a really good depth of flavour or you could even try bacon fat. Use the leftover egg whites to make meringues, macarons or mousses. 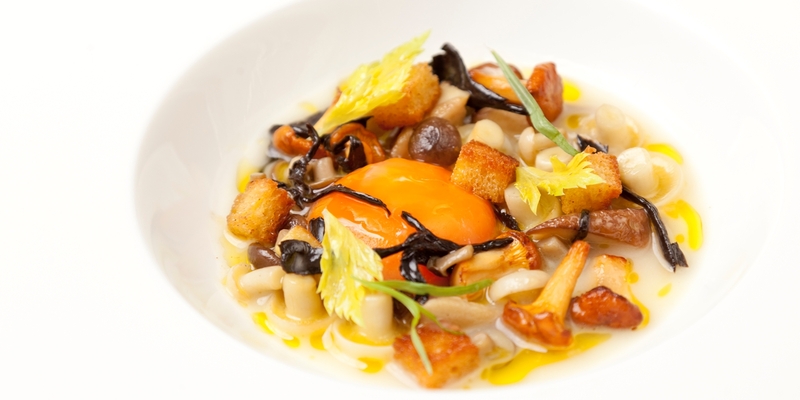 Shay Cooper serves his confit egg yolk in a refined starter of Chicken soup and glazed wild mushrooms while Nuno Mendes’ delicate Confit cod with egg yolk and saffron makes a challenging yet delicious main course.